About a year ago the music world was abuzz with bloggers bragging of the bargains they had brought home from Tower Records. The chain was closing down forever, an early victim of the continuing collapse of the record industry. I don't miss Tower Records in the slightest. But I did enjoy picking through the remains at the various levels of discount, a kind of musical near necropsy. Apparently I needed more clutter. I still have albums from the final 90% off frenzy which I haven't opened yet. Click for an enlargement. If anyone wants to submit a picture showing what socially useful purpose has been found for their local Tower location I'll be happy to add it to this post. Sit and Sleep is advertised on television almost continually by Larry Miller, its owner and pitchman, announcing in an annoying sprechstimme that "We'll beat any advertised price or your mattress is free." thus proving that we Americans are, as a group, not very good at logic. I asked the saleswoman if they'd ever given a mattress away for free, knowing full well that they hadn't. She had her response down pat segueing easily into stories of what a great boss Larry is and how the illogical catchphrase had made the company into a huge success. They probably teach all that on the first day at Sit 'n Sleep University. She also said lots of really disappointed people have been showing up at the store looking for Tower Records. Those must be the customers who only bought albums once every few years. There's still a large yellow and red Tower sign visible from the parking lot. 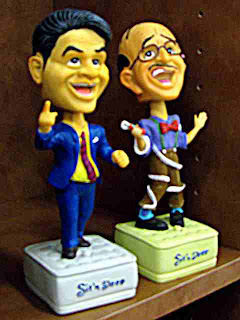 Here's a picture of Larry and his accountant Irwin as bobbleheads. Why would I expect logic from a bobblehead. The saleswoman wondered what the Chinese factory workers who make these things think of them. They cost $16 each, about the same as a compact disc. I didn't buy one, but I thought about it. Even a lousy compact disc that I only listen to just once would be better value for my entertainment dollars. 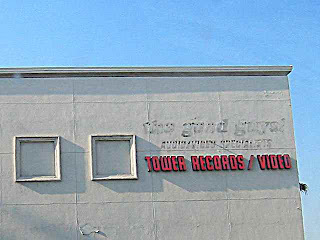 Read about Tower Records here.